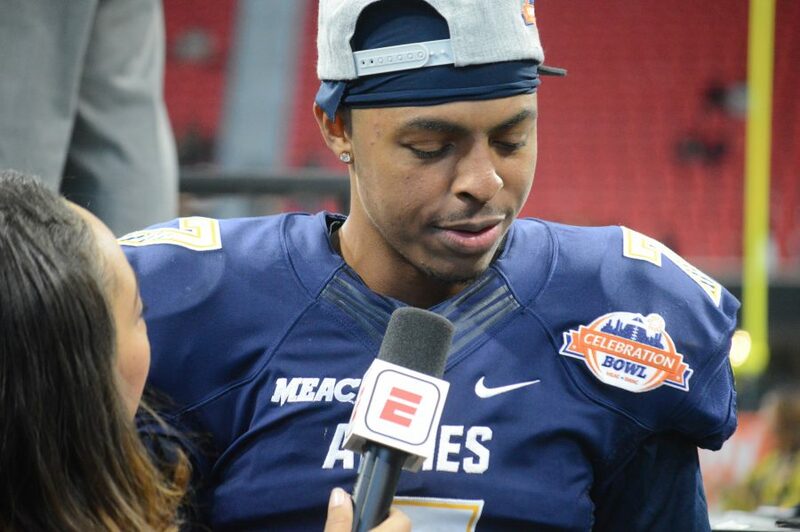 The honor for the best player in the Football Championship Subdivision is up for grabs again this year and two HBCU student-athletes are in the running. North Carolina A&T quarterback Lamar Raynard and Alcorn State running back P.J. Simmons were named to the initial Watch List for the Walter Payton Award, given to the top player in FCS football annually. Raynard, a redshirt senior from High Point, NC, is the reigning MEAC Offensive Player of The Year. As a junior on the field last season, Raynard led A&T to a 12-0 season, claiming the MEAC title outright for the first time in over a decade and then led the team to a victory in the Celebration Bowl with the go-ahead touchdown as the team would go on to be named HBCU national champs. Simmons, a transfer from Kent State, looks poised to have a big final season for ASU. The Tallahassee, FL native had some big moments in 2017 as a complement to De’Lance Turner, who is now with the Baltimore Ravens. Despite a limited role, Simmons rushed for 687 yards on just 80 carries, averaging 8.6 yards per run. Both Raynard and Simmons were named to the HBCU Gameday FCS Preseason All-America team last month. The award is named after the former Jackson State running back Walter Payton who went on to a record-setting career with the Chicago Bears.